Question (and yes great book) can you share with us how-tos on the related post widget you are using here that produces automatically generated material. All you need to do is make sure the last option, “Hide related links on this blog, which means this blog won’t show up on other blogs or get traffic that way” is unchecked. So, on WordPress.com, having the automatically related links is the default option, I believe. You can decide you don’t want to have it, but as Peggy points out, it can be really helpful to your readers. They are automatically generated, so they aren’t guaranteed to be related, but on balance I think this is a good option. I’m sure some SMUGgles found their way to our University originally because of a possibly related link on someone else’s WordPress.com blog. If that’s your story, I’d love to hear from you in the comments. Please let us know if the automatically related links helped you discover SMUG. That will help our fellow SMUGgles see the value of this feature as well. While I was doing this post I saw another feature that has no useful point, but I’m turning it on just for effect. Let me know what you think of the falling snow. Only available on WordPress.com, and only until 1/4/09. As Ashok asked, here is how you can use the Friendfeed application to import updates from Twitter, your blog, YouTube, LinkedIn, Flickr and dozens of other services into your Facebook profile. First, you need to sign up for FriendFeed. Then, install the Friendfeed application on your Facebook profile. After that, it’s pretty straightforward to have your updates that are fed into Friendfeed also be posted to Facebook. I like Friendfeed in that it has the ability to aggregate information from various social sites. I’m sure I don’t get nearly as much out of it as I could, but even so, it’s been useful. If other SMUGgles have stories or examples of how you’re using Friendfeed effectively, I hope you’ll share them in the comments below. RAQ: How Do You Generate Related Links? How did you generate the “Possible related posts”? It’s really simple. Automatic even. By making sure you have the second box unchecked, you automatically generate possibly related links. And your posts are eligible to be included in the possibly related links in other WordPress.com blogs. 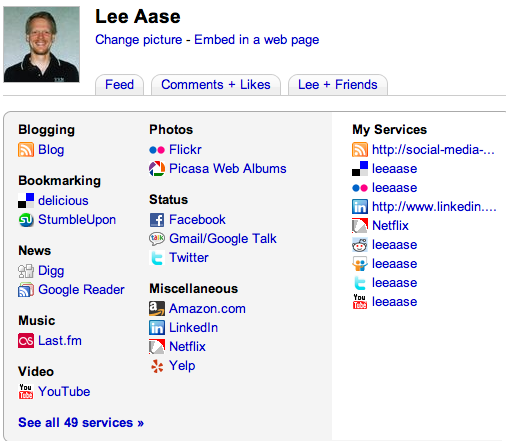 Author Lee AasePosted on October 27, 2008 Categories Blogging, Chancellor RAQsTags Related links, wordpress.comLeave a comment on RAQ: How Do You Generate Related Links? So when Dave lamented this feature, I Tweeted back that he could work around it as I had in my sidebar widget. Updated 12/22/08: In response to a comment below, go here to see how you can have your latest Tweets show up in your sidebar. RAQ – Photos from a Flip Camera? I’ve gotten something of a reputation as a Flip video camera booster (you might even say it’s the official video blogging camera of SMUG), and today a friend copied me on an e-mail about an offer for a free Flip that included a question for me and led to some others. In keeping with our Recently Asked Questions feature, I’m sharing both the link to the free Flip offer and the subsequent dialogue. Author Lee AasePosted on August 28, 2008 Categories Chancellor RAQs, Facebook, videoTags Discover Card, Facebook, Flickr, Flip, Flip video, free, photosLeave a comment on RAQ – Photos from a Flip Camera?